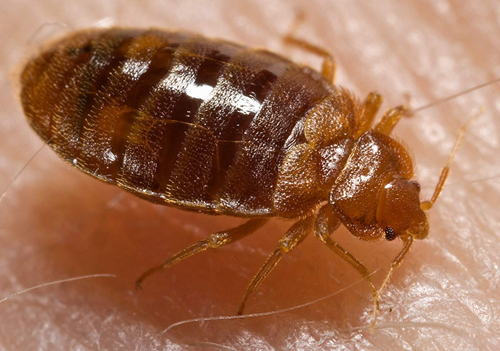 Bedbugs are small, crawling parasitic insects and all species feed on warm blooded animals. There is one bedbug that feeds on blood from humans, Cimex lectularius, which can result in painful bites. Adult bedbugs are small (usually 4-5mm long) flat, oval in shape and reddish-brown in colour. They stay close to a food source so are found in areas where people tend to rest and sleep, hence the name bed bug. Bedbugs are becoming an increasing problem both in this country and around the world. Their resurgence may well be related to a global increase in international travel (they travel in luggage and/or clothing) as well as their suggested resistance to certain pesticides. There is also a general lack of awareness of signs that point to an infestation. Bedbugs spread extremely quickly and easily and are complicated to treat; resulting in a rapid growth in the number of outbreaks around the world. The key to beating the problem is to raise awareness of the signs to look for and to ensure bedbugs are dealt with quickly and effectively by a professional pest controller once discovered. While it is theoretically possible for bedbugs to transmit disease, currently there is no real evidence of this. Instead the main concern is the irritation and distress generated by bedbug bites along with the possibility of secondary infection from constant scratching. Bedbug bites themselves do not hurt. It is the itchiness that results from the body’s reaction to these bites that can cause great discomfort. Treating bed bug bites soothes the irritation, but it can still be very distressing when there are many bites, as is often the case. Multiple bites can also lead to an itchy rash or eczema so always consult a pharmacist for advice and treatment if this occurs. Bedbugs are a stubborn pest and one of the most difficult to eradicate. High levels of hygiene, deep cleaning and the use of a DIY bedbug spray will help to reduce numbers however professional bed bug treatment will be required to eliminate an infestations. Bedbugs are very hard to get rid of; there is often a need for spraying with insecticides as well as traps as well as the need for multiple treatments to rid the problem. If you think you may have an issue with Bedbugs, then contact us and Pesky Critters will deal with the problem for you.